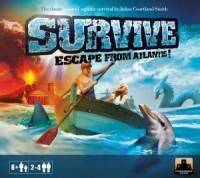 Game Tips for Survive: Escape from Atlantis! Many players will start their meeples on mountains, even if they are inland… swearing off the beach. However, at the beginning of the game, it’s best to be close to the boats, even if it means being on the beach. Why? Because you don’t want to waste movements just to get to the edge. It’s best to jump right on board. Anyway, falling in the water early on is better than later. There are only 3 instant sharks in 15 tiles and the serpent is far away (only ones serpent move tile). The odds are on your side. If your beach tile is removed, you can move the boat to the meeple. This doesn’t mean that you shouldn’t place or move meeples to mountains next to the water. Just don’t avoid the beach at the expense of moves. One of my mistakes in this I think was to not always go for the “sure thing”. If you spread your attention out too far by advancing many meeples a little each, rather than going for the guaranteed safe ones, likely whatever you had set up will be destroyed by the next few players turns… or endgame. Be conscious of how close the island is to destruction, and act accordingly. I played this game with my wife and my father–both of whom are not “gamers”, but they loved this game! (I was both shocked and elated to see just how much they loved this game). We played a few times, and we found that sometimes one person would be out of meeples before the other two. Rather than sitting back and watching the end, we let the eliminated player still take a tile from the board (and use any tiles they still could–i.e. move a monster to any empty sea space); and roll the die for movement. This kept a person who was out engaged still, and they had fun going after the other players. 1. The other player(s) on the ship will not sink/destroy the ship. I always wait for another person to put 2 guys in a boat. Then I grab the last spot. This allows you to get you meeples moving without wasting your movements. It also helps in that the other people on board aren’t going to sabotage their own meeples. What a lot of people forget about Survive: Escape from Atlantis is that it is, at it’s heart, a game of speed. The longer that you leave meeples in a position of vulnerability, the more likely that something bad will happen to them. Even the island of Atlantis itself can turn against them. Therefore, you want to get your Meeples off the island, and not just the small value ones. But other players are going to be competing the same way. So how can you turn this to your advantage? Try this strategy. Place three meeples at opposing ends of the island; you should be able to secure at least that many. Place one high-value meeple as one of them, and two lower-value meeples at the other areas. Save your mid-range meeples at the middle of the island to try and take advantage of areas that open up later on. Try and place as many boats as you can near those meeples, or make your way to boats that are already present near other meeples. Your goal should be to get your highest-value meeple to safety, and use the other two as decoys while still trying to get them to safety. Since most people try to get their high values off first, odds are that you can get your low-end meeples to either hitch a ride with someone else, or play taxi. Don’t count on being able to control the boat; instead, control the hazards. Try and take down meeples along with your own smaller values, in the hopes that you will eliminate the competition. At the same time, try to work hazards away from your boat without being too obvious about it. The key to this strategy is to keep your opponents guessing. More boats will turn up near the island, and you can make a run for it with your mid-range meeples later on; you will likely lose one or two, but the gamble is that you take out an opponent’s 6 early on to make it a tradeoff. I love variants, and this one adds a devious touch to an already evil little game. A gun. Each 1 point meeple is considered to be carrying a gun (to remember this, you can put a dot on the bottom with a pen or pencil). Each person tries to keep track of his/her gun toting meeple. At the beginning of your turn, if you think you know your gun meeple is on a boat, you can show the bottom and use it to kick the others off the boat. You do not have to kick both off (if say,you have two meeples on the boat). If you are wrong, the gun-less meeple is kicked overboard. This can only be used once per game per person. Again, it is an action… played before the rest of your turn. Do not put all your big points (6,5,4 meeples) in one area of the board. Split them up to the corners. Do not put all your meeples on one boat! Split them up as best you can. Many copies from the original run of the game have a printing problem with the rocky portion of the island. The printing on the back is misaligned, leaving white strips along one side of the tiles. It is possible to distinguish the tiles this way, possibly even noting which one is the volcano. Stronghold games will gladly swap these bad pieces with you if you contact them. The overall quality of the rest of the components is outstanding, and they want to maintain a good image in this area. They also include an entirely new set of rocky tiles with the 6-player expansion. It’s the exact same set, but without the printing problem. If you sic sharks, whales and seamonsters on a player for no clear reason, they’ll obviously consider retaliating. I use a simple technique to soften the blow. I play defensively first. If I can move a shark away from me, even if there is an obvious play to eat another player, I’ll protect my guys. In the early stages of the game, I will attack other players in order, rotating around to my left. If I attacked you last round, I’m attacking the next player this round. Period. Even if I could eat 3 of your swimmers vs 1 of his, I’m going for him. I let the other players know that I’m doing this from the outset. It’s predictable, and democratic. No skipping players. Once players start getting people to safety, the rule changes. I go after the person with the most people safe. If two players are tied, I alternate between them. Again, logical and democratic. Obviously, many players like to be more chaotic and opportunistic. Even I don’t always play the way I’ve described, but I found that it works very well with my kids and their cousins. No one ever feels that Uncle Corey is ganging up on them. Watch the number of tiles left on the island. Remember that any rock/mountain piece could be the eruption that ends the game. Divide the number of tiles left on the island by the number of players – that’s how many turns you’ll have left, at MOST. If your swimmers are too far away from safety, start prioritizing.